200 children and their parents receive the surprise of their life when Pope Francis walks into their school during an event. By Sr Bernadette Mary Reis, fsp Another Mercy Friday for Pope Francis; a complete shock for the staff, children and parents participating in an event at the Elisa Scala Institute, a state-run school on the outskirts of Rome. What a surprise! For 5 months the students at Elisa Scala Institute have been preparing for an event called “We are the protagonists.” It gave the students the opportunity of immersing themselves in a variety of artistic, athletic and dramatic disciplines. Proud parents had come to participate when in walked Pope Francis! Claudia Gentili, the school’s principal, told Vatican News what happened as people began to realize that the Pope had arrived. “When we saw him arrive—this white figure under the sun—the reaction was one of disbelief and incredible emotion. Both the children and their parents couldn’t believe their eyes”. 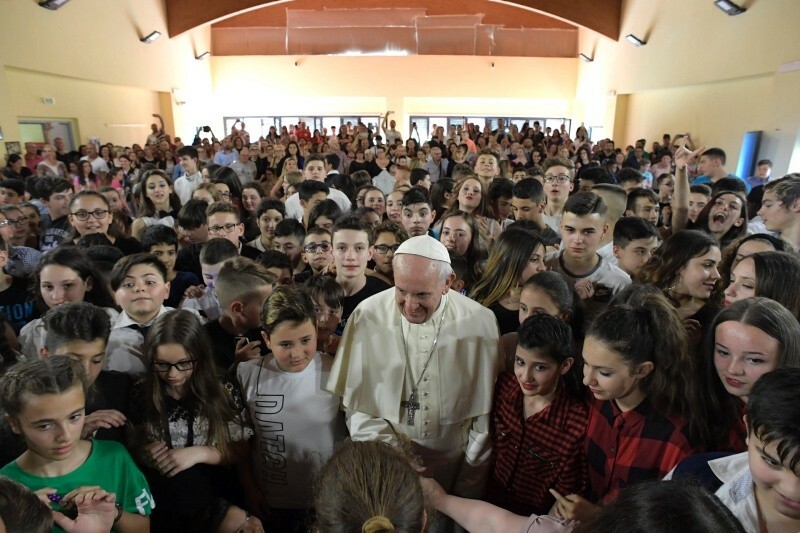 The school—place of encounter, growth and formation Pope Francis once again highlights the role of the school. He himself led the students in the cheer—“place of encounter, growth and formation”. "How true this is", Ms Gentili said. “In a neighborhood as isolated as ours is, truly on the margins of the world, we are the only point of reference for these children”. “Elisa’s Library” The school, originally built in the 1950s, now bears the name of 11-year-old Elisa Scala who died in 2015 from leukemia. She had a passion for books and libraries. Her parents proposed that a library be built in her honor. Thus, Elisa’s Library opened in December 2015. It now contains over 20,000 volumes, in many different languages, donated from all over the world. The library now contains several more books all bearing a dedication by Pope Francis to Elisa which the Pope gave to Elisa’s parents.